Description: View of the chapel. The chapel contains numerous works of art. 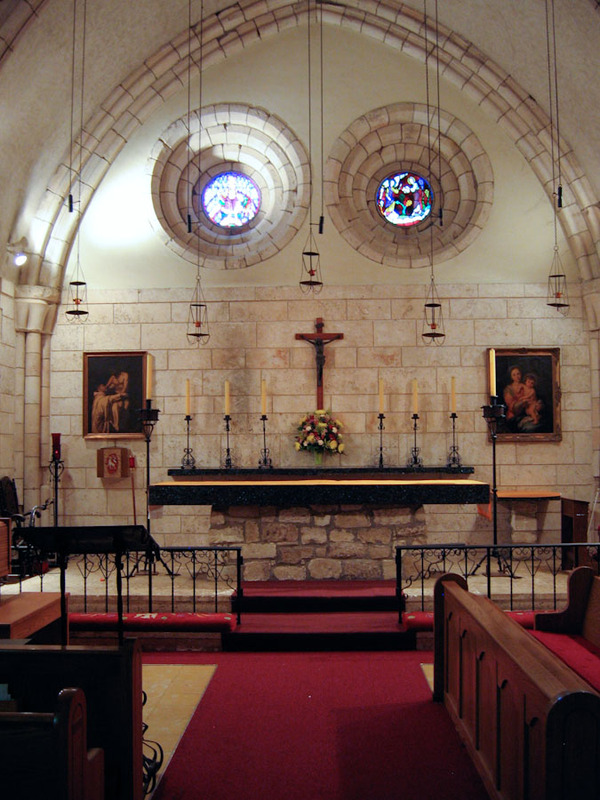 In addition to the ornamental architectural characteristics such as vaulted ceilings, arcading arches, columns, and telescopic stained glass windows, the chapel has two paintings hanging on each side of the alter. The one to the left is called "Vision of St. Bernard" and dates around the year 1540. The baptismal font pictured here dates back 800 years and was used in the original monastery as it is still used today by the church. TIFF File: A high resolution TIFF of Chapel (27.9 Mb) is available for download. This is a very large file suitable for printing. For most on-screen purposes, you should use the image displayed on this page instead of this TIFF.